On April 10th you are invited to Smart City Hub #3 where innovative Smart City ideas are generated and new contacts are created across students, businesses, researchers and municipalities. 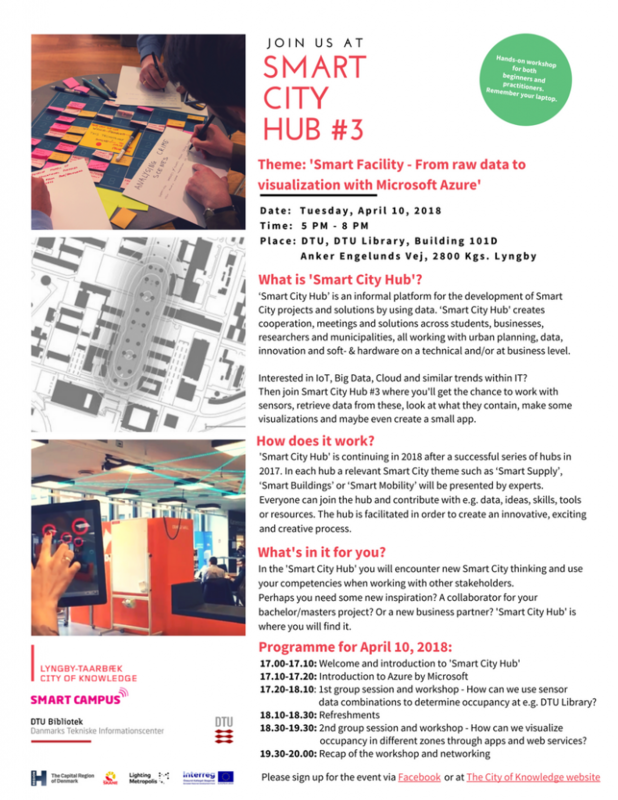 The theme of Smart City Hub #3 will be presented by Microsoft and DTU Library and the topic will be ‘Smart Facility – From raw data to visualization with Microsoft Azure’. The hub will take place as a hands-on workshop where both experienced FM practitioners and beginners can join and you will gain insight into the work with Smart Facility Management and how data from sensors and meters can be used to optimize and streamline processes and building management. ‘Smart City Hub’ is a physical platform that creates collaboration, meetings and solutions across students, businesses, researchers and municipalities, all working with urban planning, innovation, data and soft- & hardware on a technical and/or at business level. In each hub a relevant Smart City theme such as supply, buildings, planning and mobility will be presented by a company or organization, and it will be facilitated by the hub’s facilitator Finn Kollerup. Come and help us develop the best Smart City solutions that make the City of Knowledge more attractive and sustainable for all of us. Smart City Hub #3 will take place on April 10th from 5-8 PM at DTU Library.